I've been getting a lot of really bad avocados recently. A good avocado is a thing of beauty, geode-like in the contrast between inside and outside; between butter and lizard-skin. The texture of a good avocado, matte and silky, just invites you to slice, to split it into smooth-sided little slivers or cubes or crescents. 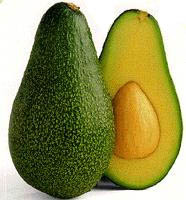 And then there is the bad avocado: brown streaks, goopy bits, rough chunky edges and stringy filaments threaded through. Twice in the last two weeks, I've been served inedible avocado. Once at the Doral Marriott in Miami, and once at the Bonefish Grill up here in Tally. And my question: What gives? I mean, it'd be one thing if they served the thing whole, skin side out, fruit still a mystery, but this is prepped food with the evidence splayed out for the world to see. It got me thinking that maybe the delineation between a kitchen that cares and one that does not is the avocado. If the prep guy, seeing the oozy, icky brown bits, sends it on; if the chef drops it on a salad, or atop a chicken sandwich; if the room service guy picks it up and brings it to your room; and if none of them do anything to stop the horror, something is amiss. Bad avocado = bad kitchen. I also had one good avocado, at Fusion Cafe in Tallahasee. Trendy and quiet, with a mostly-black, concrete-floor and square-plates metro aesthetic, Fusion does a good job balancing an upscale feel with a cheap, funky menu. They do a nice gumbo - thick and rich, if a little under spiced. Salads are excellent, with good field greens and house-made dressings. They have good crab cakes, they do a flashy spinach lasagna, they have hamburgers. The Cobb Salad I got this week, containing the aforementioned avacado, was excellent - each element distinct and crisp, avocado lush, bacon crispy, balsamic subtle and sweet. The impressive thing about this place, though no individual item rises to the level of epiphany, is that they do everything well. This is a competent restaurant with a creative bent and decent service. I wish they'd managed a little more oomph into the dishes - a little more spice, a little more creativity, a little more precision, but those wishes don't change the fact that this is a place that looks, feels and tastes well above the norm.